Our first order of business this morning is to review the recent performance of ECYT, which we initially slated for observation in our report on February 28th. At the time, the stock had been slowly gaining momentum for much of February, and it looked ripe for a more pronounced breakout. That day, as the stock was trading for as little as 4.51, we witnessed an explosion in volume that has precipitated a very impressive run, persisting for over two weeks up to the present time. Yesterday’s session brought a new high of 11.54 in ECYT, which marks an upswing of 156% in a relatively short time frame. We had some longer-term ideas as well which we will likely come back to in an upcoming report, as it appears VRX will continue to head up. On that note, we’ll also look to roll up our strike prices on the weekly calls to the $16 & $16.50′s. 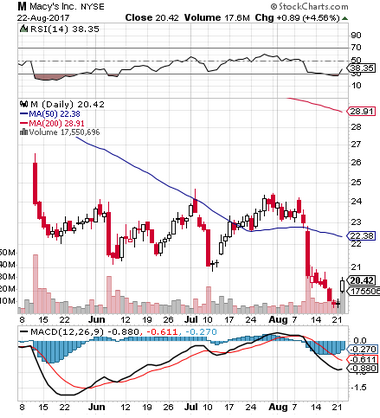 Macy’s, Inc. M - With the holiday season fast approaching, we’ll be on the lookout for retail plays with good upside potential, and Macy’s could be a good fit in that regard. You can take a look at the chart below and see that the stock has just begun to show signs of a rebound after getting absolutely hammered earlier this month. Indicators suggest that the stock is rather oversold. We’re going to radar a set of longer-term contracts, the M 11/17 $23 Calls, which should see a nice move if the stock can indeed regain the ground it’s lost over the past few weeks. There’s also a gap on the chart to the $28 area, the filling of which would propel those contracts to huge gains. 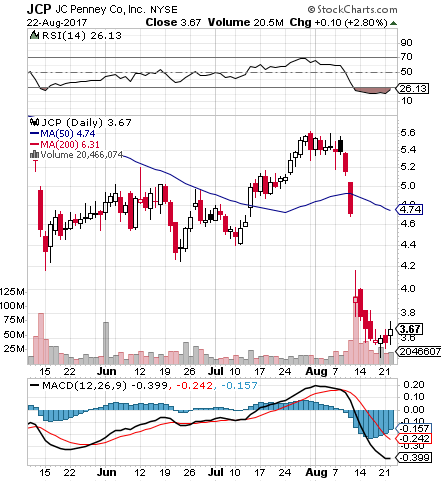 JC Penney Co. Inc. JCP - Another retailer we’ve talked about many times in the past, particularly leading up to and during the holidays, is JCP. Similar to the above mentioned play, the stock took a punishing hit to its PPS over the past few weeks, and has shown the beginnings of a rebound. It has an even larger gap on the chart, and a chance to fill it even quicker. The stock itself could end up being a good recovery play, but we’ll also want to put a couple sets of options contracts on watch as well, with the JCP 11/17 $4 and 4.50 Calls. More Retail Ideas – Also in the retail sector, and each with premarket earnings beats, are American Eagle Outfitters, Inc. AEO and Express, Inc. EXPR. We’re going to radar the AEO Weekly $12 & 12.50 Calls, and the EXPR 09/15 $6 & $7 Calls. We also wanted to quickly update readers on the performance of ZN, after it was a topic of discussion in yesterday’s premarket report. While the stock didn’t break out by any means, it did trade from a low of 2.95 to a high of 3.42 for a modest 16% intraday move. It did, however, manage to close just two cents below its high of day, so we’ll have it on continued watch this midweek, looking for the recording of higher highs and higher lows.